This is a new format for medical online learning material, and we would appreciate your thoughts and feedback. 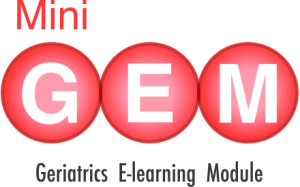 If you would be interested in joining AEME and creating your own Mini-GEM, please read our ‘Guidelines for Authors and then get in touch! Why do we need Evidence Based Medicine in Geriatrics? Always use Protection.... for the Bones. A Summary of Bone Protection Therapy. Dark Clouds over Golden Years: Late Life Depression. a Transatlantic Mini-Gem! Dementia in Africa - Does it matter? Will you just have a look at this abdo X-ray? My Patient With PD Can't Swallow Their Meds - Gulp!